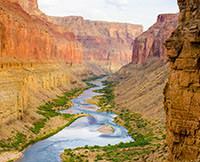 The Grand Canyon rafting trip was on of the best holidays one has been on. The place, the people, the outdoor accommodation, and the great food. The shoulder injury did nothing to mar such a wonderful experience. A recommended must!